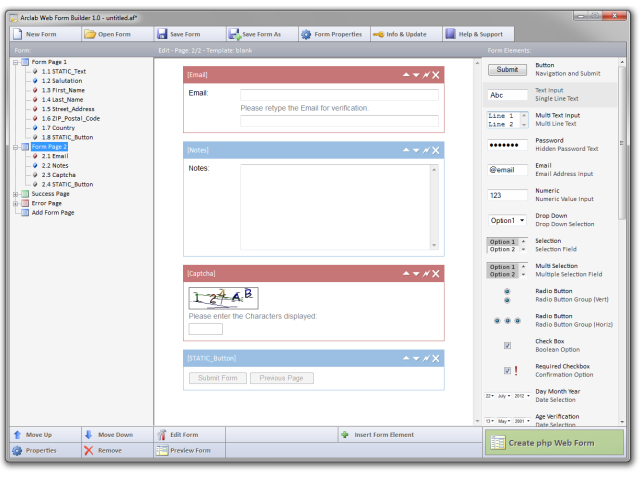 Arclab Web Form Builder makes it easy to create HTML forms, php forms and email forms. The visual workspace lets you fill the form with all types of form elements and allows a seamless integration into your website and corporate design.Build and design contact forms, registration forms, multi-page forms, feedback forms and other web forms using a visual environment without any coding or knowledge of php/HTML. Software to create HTML Forms, multi-page Forms, php Forms and Email Forms. Add text input, multi-line text input, drop-down lists, date input, checkboxes, radiobuttons, multi-select input, pre-filled input fields (e.g. for country selection) and many other fields in a visual environment without any coding knowledge. Arclab Web Form Builder also includes a captcha as challenge-response test to ensure that the form was filled out by a human and not by a bot. Qweas is providing links to Arclab Web Form Builder 1.02 as a courtesy, and makes no representations regarding Arclab Web Form Builder or any other applications or any information related thereto. Any questions, complaints or claims regarding this application Arclab Web Form Builder 1.02 must be directed to the appropriate software vendor. You may click the publisher link of Arclab Web Form Builder on the top of this page to get more details about the vendor.